The Eighty-eighth United States Congress was a meeting of the legislative branch of the United States federal government, composed of the United States Senate and the United States House of Representatives. It met in Washington, D.C. from January 3, 1963, to January 3, 1965, during the last year of the administration of U.S. President John F. Kennedy, and the first of the administration of his successor, U.S. President Lyndon B. Johnson. 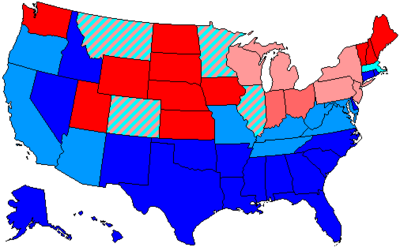 The apportionment of seats in this House of Representatives was based on the Eighteenth Census of the United States in 1960, and the number of members was again 435 (had temporarily been 437 in order to seat one member each from recently admitted states of Alaska and Hawaii). Both chambers had a Democratic majority. November 22, 1963: Vice President Lyndon B. Johnson became President of the United States on the death of President John F. Kennedy. March 30 – June 10, 1964: The longest filibuster in the history of the Senate was waged against the Civil Rights Act of 1964, with 57 days of debate over a 73-day period. It ended when the Senate voted 71–29 to invoke cloture, with the filibuster carried out by southern members of the Democratic Party, the first successful cloture motion on a civil rights bill. Senators are popularly elected statewide every two years, with one-third beginning new six-year terms with each Congress. Senators are ordered first by state, and then by class. Preceding the names in the list below are Senate class numbers, which indicate the cycle of their election, In this Congress, Class 1 meant their term ended with this Congress, requiring reelection in 1964; Class 2 meant their term began in the last Congress, requiring reelection in 1966; and Class 3 meant their term began in this Congress, requiring reelection in 1968. (2) Vacant Sen. Robert S. Kerr in previous congress. (2) Estes Kefauver (D) Died August 10, 1963. (1) Clair Engle (D) Died July 30, 1964. (1) Edwin L. Mechem (R) Lost special election. (2) Hubert Humphrey (DFL) Resigned December 29, 1964, after being elected Vice President of the United States. (1) Pierre Salinger (D) Resigned December 31, 1964 to give successor preferential seniority. ^ Loevy, Robert D. (1997). The Civil Rights Act of 1964: the passage of the law that ended racial segregation. SUNY Press. pp. 358, 360. ^ "Civil Rights Filibuster Ended". U.S. Senate. Archived from the original on December 2, 2009. Retrieved December 19, 2009. ^ "Major Features of the Civil Rights Act of 1964". CongressLink. The Dirksen Congressional Center. Archived from the original on December 6, 2014. House of Representatives Session Calendar for the 88th Congress (PDF). Official Congressional Directory for the 88th Congress, 1st Session. Official Congressional Directory for the 88th Congress, 2nd Session. Pocket Congressional Directory for the 88th Congress.